At what point does the term “entry level” begin to lose its meaning? Every industry has its incumbent, the one that can walk into any room where a gathering of the greats is going on and interrupt without a need to throw down a list of credentials. In the automotive world, that brand is Ferrari. That’s because for decades, Ferrari has created some of this world’s most memorable machines that combine skin crawling speed, mind-bending capability, electrifying connection, and floods of emotion. Then, Maranello’s finest craftsmen take all of that and wrap it in a pretty Rosso Corsa Red package. 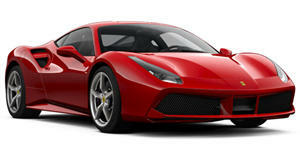 The latest of the “entry-level” supercars from Ferrari is the 488 GTB, cheaper than the F12 tdf and with more lap time friendly capability than the California T or GTC4Lusso. But just how much better is it compared to its brethren? Evo wanted to know the answer to that question too so it borrowed a 488 GTB and just so happened to knock on the door of the nearest race track. At the Anglesey Circuit where many a hypercar has been benchmarked before, Evo pushed the 3.9-liter twin-turbo V8 hard, keeping its tires hot and their knuckles white. The result was a 1:12.8, or exactly the same time as a McLaren 675LT and only 0.2 seconds slower than a McLaren P1. Some of the YouTube comments suggest that Ferrari may have cheated by giving it a press vehicle tuned for more speed, but the reality is a mystery. It would be right up Ferrari’s alley to tune one of its press vehicles for a test, but it won’t stop us from wanting one.